Have you heard? Your standard incandescent light bulbs are phasing out of production this year. Home Depot reports that they have about a 6 month supply left (as of January 2014), so if you really think you need them, you better get out there and stock up. You may be worried about the cost of this change, as you surely got a dose of sticker shock the last time you looked at light bulb choices. It’s hard to justify paying $30 for a CFL or LED light bulb versus 50 cents to a dollar for an incandescent, especially if you are replacing bulbs throughout your entire home. The good news is, the costs are coming down and the savings seems worth it. You can now get a LED bulb in different levels of brightness and warmth for $10! AND, if you use a LED bulb in your home, it could last up to 60,000 hours compared to 1,000 hours of an incandescent bulb. That can save you around $200 in replacement bulbs! Let’s get with the times and embrace the change. Personally, I am a fan of LED lighting over incandescent for a few reasons. Their brighter, blue hue – very clean and clear. You also have a choice of warmer hues too. They are more durable with a life expectancy of 23 years with normal use. They are certainly more efficient, therefore, better for the planet. They just became more affordable. Now that the LED bulbs are more affordable, I am definitely in favor of using LED lights throughout the home. Here is a light bulb comparison chart to help you make your decision. We would love to know about your choice for light bulbs. 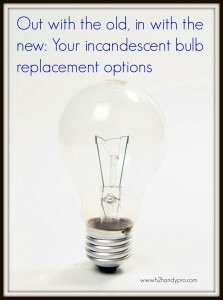 Which option will you choose the next time you need to replace an incandescent? Please comment below.